Creating "buzz" on the trade show floor is pivotal to drawing attention away from the competition and increasing meaningful traffic to your exhibit area. With more visitors exposed to your products and sales message, your trade show sales team has a greater prospect pool in which to pre-qualify leads and generate sales. As a result, savvy exhibitors are continuing to deploy new and creative methods to attract trade show visitors. 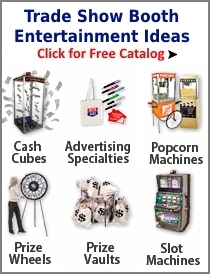 At trade shows across industries and locales, exhibitors are capturing attention from passersby with tactics that range from using striking graphics and creative lighting to featuring unique product demonstrations, crowd-pleasing game shows and other live entertainment in their booths. Among the many vehicles used to increase traffic, trade show booth entertainment has become an increasingly popular strategy in accomplishing event objectives. Putting competitions, booth game shows, magicians, money blowing machines, Hollywood look-a-likes, sports simulations and virtual experiences (i.e. surfing, skiing, flying) are some of the entertainment methods used to garner the interest of show attendees. The key to using trade show entertainment and attractions effectively is to choose a unique, high-appeal concept or individual that complements your company positioning and allows booth staff the opportunity to engage visitors. Having trade show staff encourage event visitors to participate in a fun, engaging activity at your booth is an effective way to initiate communications and begin the relationship-building process with potential buyers. 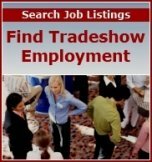 Unique, enjoyable trade show entertainment gives event attendees an enticement to visit your exhibit if they are were not aware of your company before. If they enjoy what you have to offer, they will remember the experience. Yet, it is essential that visitors also remember your products and key points of distinction. That's why it is important to have your entertainment complement your message to help drive sales. As you evaluate trade show attraction options and providers, solicit feedback from past users. Contact these exhibitors and ask for their perspectives on the effectiveness of the booth entertainment and their satisfaction levels. Talk with entertainment suppliers and discuss ways to integrate your sales message into the offering. In addition, your booth staff must be trained on how to maximize sales opportunities along with the trade show attractions in your booth. This includes training on delivering a compelling to-the-point sales message and the appropriate timing relative to the entertainment in your booth. In the end, your booth staffers must ascertain the purchase potential of each trade show visitor and collect complete lead information for prompt follow-up after the show.